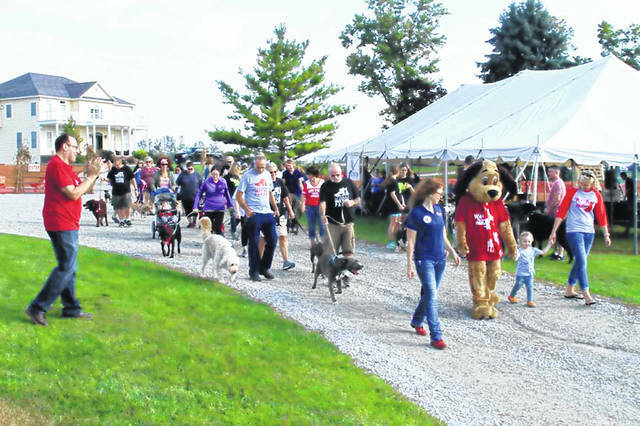 Joe Laber, left, of Troy, cheers as dogs and their people begin the sixth annual Shelby County Animal Rescue Foundation Walk to End Parvo at Vandemark Farms in Sidney, Saturday, Oct. 6. 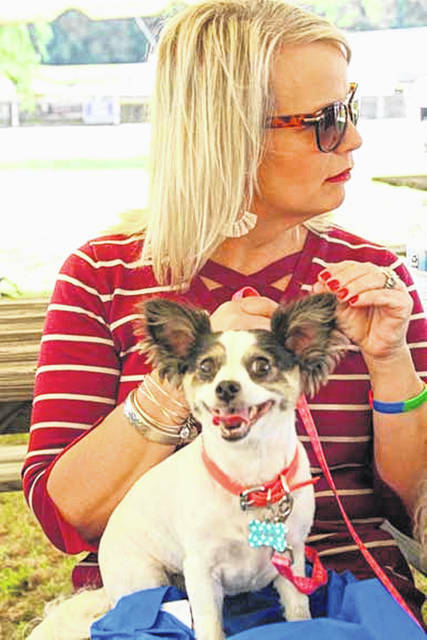 SIDNEY — The Shelby County Animal Rescue Foundation (SCARF) announced a new, educational initiative, Saturday, Oct. 6, during the opening ceremonies of its sixth annual Walk to End Parvo at Vandemark Farms, here. Chastity Crowder, of Lockington, educational director of SCARF, introduced the organization’s Pet Education Program (PEP). SCARF hopes to bring a higher level of public awareness concerning how to properly care for pets. Along with her other duties, Crowder is a professional dog trainer and has trained dogs at the Shelby County Animal Shelter as a volunteer for five years. “I was a volunteer at the shelter and started training the dogs there to make them more adoptable. Often dogs are returned because people have little or no experience with a dog and get discouraged if they don’t know how to deal with behavioral issues. Other dogs are returned because of incompatibility with pets already in the home. Today we are conducting a soft launch to introduce people to PEP. It is important to teach future generations to be responsible pet owners by becoming an animal hero. This is accomplished by understanding five simple steps: water, food, shelter, care and love. We will take a more aggressive approach after the completion of the new animal shelter slated to be completed by fall of next year. Eventually we will share programs about pet care in the local schools and conduct workshops and training exercises at the new facility,” Crowder said. Almost 100 people gathered at Vandemark Farms, for the Walk to End Parvo. The annual event is a fundraiser to help prevent parvo at the local animal shelter. Canine parvovirus type 2 (Parvo) is a contagious virus affecting mainly dogs and thought to have originated in cats. Parvo is highly contagious and is spread from dog to dog by direct or indirect contact with their feces. Vaccines can prevent this infection, but mortality can reach 91 percent in untreated cases. Treatment often involves veterinary hospitalization. Canine parvovirus may infect other mammals, including foxes, wolves, cats and skunks; however, it will not infect humans. Registration began at 9 a.m. and found a wide variety of dogs participating in the walk. On hand was Joe Laber, founding member and public relations manager of SCARF. Laber served as the master of ceremonies and was visibly excited about the event. “We’ve had no major outbreak at the shelter since we began holding the parvo walk six years ago. If you’ve ever seen it, you know how bad it can be. It is a terrible disease, but thanks to a lot of local support, we’ve not had that problem at our shelter. We are always looking for better ways to increase public awareness and get the community involved in helping to reduce this dreaded disease,” said Laber. After opening ceremonies, those in attendance heard a report from Shelby County Commissioner Julie Ehemann who introduced the SCARF board members and Scarfie, the organization’s mascot, played by junior board member Nathan Johnson. “We would like to thank everyone for coming today and participating in the parvo walk and helping to raise funding for the new shelter. At present our new total of funding raised is $2,362,947.50. We are at 98.45 percent and only $37,052.50 away from reaching our goal,” Ehemann said. Ehemann then thanked a very long list of supporters and shared a report on the progress of the new animal shelter construction. “I don’t know if you’ve been out by the Sheriff’s Office lately but at the top of the hill you can see where excavators have been preparing a building site. Westerheide Construction of Sidney has been chosen to build the new facility, and we are very close to reaching our financial goal.” She noted that several sponsorship opportunities are available. Sheriff’s Deputy and Shelby County Dog Warden Kelly Ward thanked everyone for attending. For information about the shelter, SCARF, PEP or to donate, call 498-7201 or visit helpshelbycountyanimals.com.